I love stories. I listen for the details of the stories. I also listen for how the story is told. In truth, sometimes when someone tells me anything (for anything is a story) and it is told in my style, it can be harder to listen. I jump to thinking I know. I have to work at not only being willing to listen, but also willing to tell my story. Both can be intimidating. There are many examples not only of stories but how stories are told that come in to my life every day. My life at late is all about storytelling, as I finish up one book and start on another. My father is busy translating into English "50 Bilder aus der Gossnerschen Kols-Mission (Fifty Pictures of the Gossner Kols-Mission) written in 1895 (Hahn and Kaush). There is also a Hindi translation that is in the works of being published in India. This book with its pictures provide us with such great examples of the early Gossner church in Chotanagpur, that now is celebrating its Jubilee Centennial of Autonomy. He is always very anxious to share with me some of these great stories. Today I will share one of Missionary Eckert's observations about preaching in the market place. 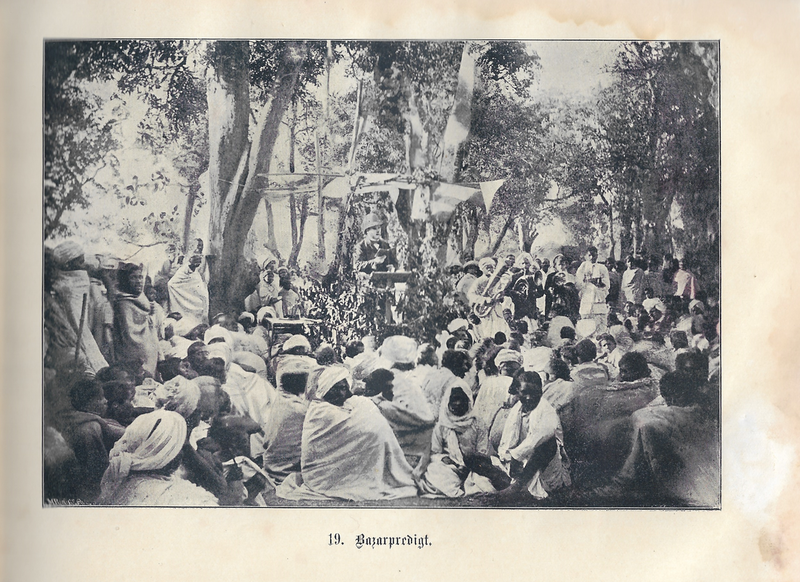 Take note the picture above shows the missionary preaching, but Christian Adivasi men and women would spend most of the time talking to the crowds during these Melas (market days). When we think of preaching we do not see it so much as simple story telling. But since storytelling was such a part of this tribal culture, the missionaries quickly picked up on the centrality of storytelling in all of life. repeats what he has said two or three times. Finally, his listeners are initiated into the story and its telling and are immensely happy when they understand what the speaker said. There is a big difference among the audience. People who have been at school can follow our train of thought, but others must be treated differently. Words and phrases such as penance, faith, love, Savior, heaven, love God above all, and so on, are completely incomprehensible to them. All that has to be learned first. (It is not necessary to mention that in older Mission communities the state of religious life is higher than in the case of these beginners in the faith.)" Many preachers incorporated this storytelling and interactive style into their preaching. I am curious to find out from readers (anywhere) how much this style resonates with them. 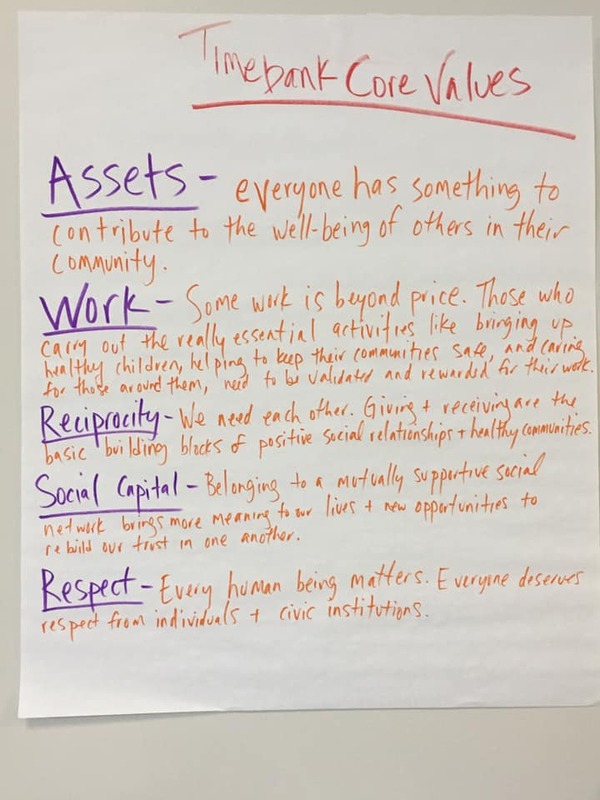 An example at my work with the Dane County TimeBank shows that we share some core values (see picture below) but I still think every single member of the Timebank would tell different stories about each of these values. This is of course a religious example using unfamiliar words and phrases, but I noticed in many different meetings that I have at work and in the community, how we don't always share common vocabulary or common values. Even in identifying those values, we do not always view them exactly the same. This is why I believe it is important to tell stories, and to read. We can only know each other, history, or work together if we are able to listen to the stories of others. Truly listen. But so much is in the style of telling. Sometimes it is hard to listen, because of the way it is being told, in addition to the perspective and the language used. I listen to Japanese News (in English) and our Public Broadcasting news and am struck with how the Japanese news is very repetitive and gives details that you never hear in American news (now this partly could be due to one of the purposes of this news program is to teach Japanese English). The American news can also be repetitive, because the context always needs to be reiterated. A friend of mine told me she gets frustrated with Indian news articles because they never give the context. If you haven't been tracking the story from the start, you have to be told it by one who has (through their interpretation, of course). I really wish I could read literature in other languages. What's on my bucket list is to learn Hindi well enough so that I can read the newspaper (that uses a lot of big words) and books written in Hindi. My collection of Hindi books to read is growing fast! Unfortunately, I did not inherit the "easy-learning-language-gene" from my great great grandfather! I do however pick up the culture of language pretty easy: that is gestures, accents, styles. So many cross cultural environments I have been in, people actually think I know their language! For example, once I was traveling from India to England as a young woman and sat next to an old Punjabi woman who sat cross-legged under her seat belt. 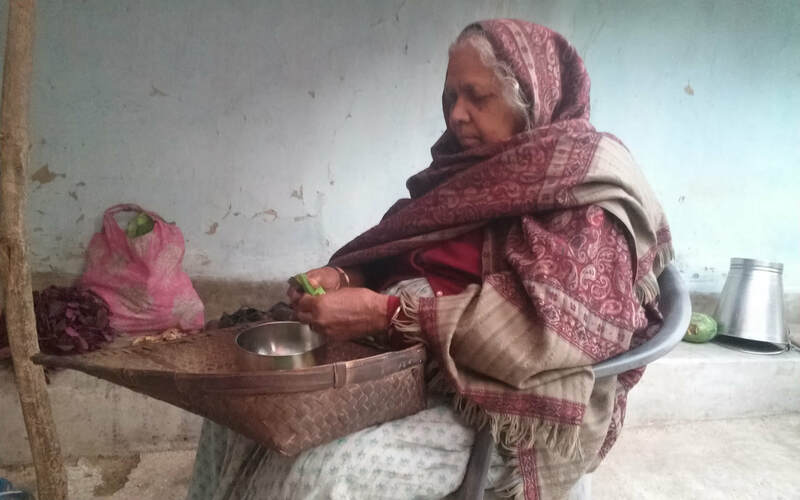 When I sat down I greeted her with "Sat-sri-akal" and the whole trip she told me her life story. I only know a few words in Punjabi, but I could tell what she was talking about in generalities, and gave appropriate gestures that made her keep on telling the story. It shortened my 10 hour flight! Another example is one my dad likes to tell about my mother. They started working in a small rural hospital in India in 1951, soon after India's Independence and partition. There were Sindhi refugees that were relocated to a nearby abandoned military air-base. The hospital was having a very difficult time treating these people when they came in for treatment. Most of them were suffering PTSD (which was hardly understood at the time). My mother acted as the social worker and would go from bed to bed to visit the patients before the doctors and nurses came in. She was able to help them figure out what to tell the doctor about their concerns. Once she was at the bed of a Sindhi woman. A nurse came by and said: "don't bother to talk to her, she speaks a different language." My mother replied: "But I am speaking with her, I'm speaking the language of love and presence. We may not speak the same language, but I am learning all kinds of things about her." The Lutheran Adivasi Christians of Jharkhand and environs have recently begun to celbrate a very important event in their history. The event occurred in 1857 during the Great Rebellion (Mutiny). 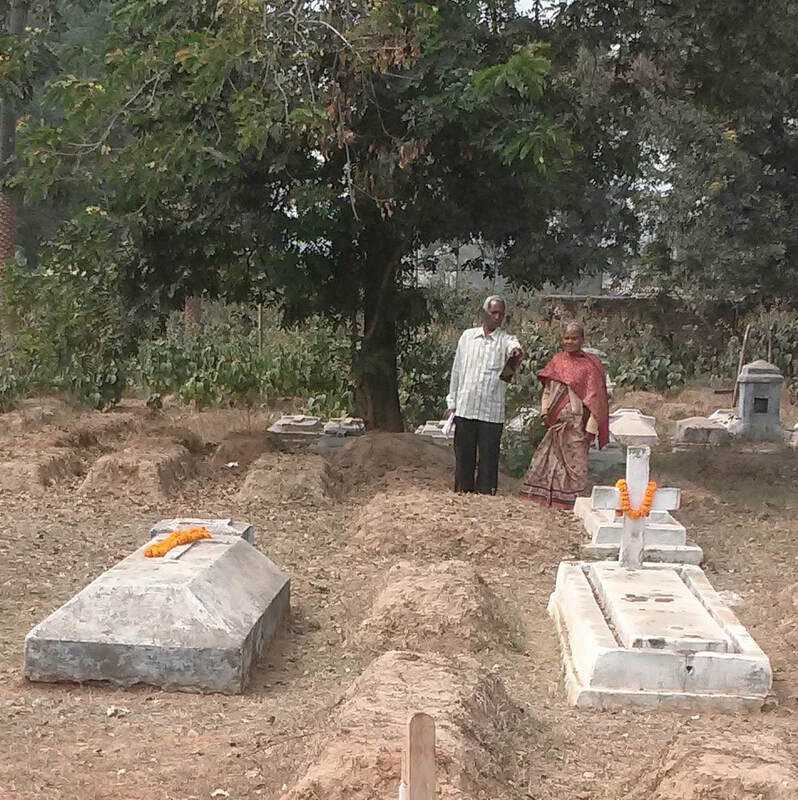 The first struggle for liberation, that most people know about in India, played out slightly different for the Adivasi Christians living in and around Ranchi. It was a time of feirce persecution that was endured at the hands of the powerful zamindars in the region (though the soldiers did seem to join in their rampage). For several hundred years outsiders had been coming into the jungle region of the Chota Nagpur plateau, taking over land that had once been only the dwelling place for various indigenous tribes: the Munda, Oraon, Ho, Kharia, Santal, etc. These orginial dwellers coexisted with each other and the land the water and the forest (Jamin, Jal, Jungle). Their existence was threatened by the growing influx of the outside world that took over their land, labor, and livelihood. The battle continues on today. But through it all their tribal identity has not been wiped out. Between 1850-1857 some Adivasi were drawn to Christianity. The Christian message of liberation and belonging spoke to them deeply. The German missionaries provided them education and socio economic stability. Both the Indian and British rulers, however, were not well pleased with this and reinforced the landownership (zamindar) system that oppressed them and alientated from the livelihood that they were so connected to. When the Indian soldiers revolted against the British East India company, that was ruling much of India in 1857, the local zamindars in Chota Nagpur took this as an opportunity to attack the Christian Adivasi. Their homes and villages, books, churches and schools were attacked. The missionaries fled. But the 700 Christian Adivasi had to fend for themselves, under the leadership of the first convert among them, Navin Doman. 100 of them, mostly children, were pursued into the jungle by armed men. The monsoon was in full force and the rivers were swollen. When they reached a river lightning miraculously hit a tree that created for them a bridge to an island. Than as equally miraculously, after all had crossed over the water washed the tree away before the armed men arrived. The group stayed on the island for several months, living off the produce of the jungle, using their age-old indigenous wisdom. Even after the river had dwindled into a small trickle, they stayed hidden away, unsure what was happening outside. The coast would not be completely cleared of the rebel forces in the region until the beginning of 1858. 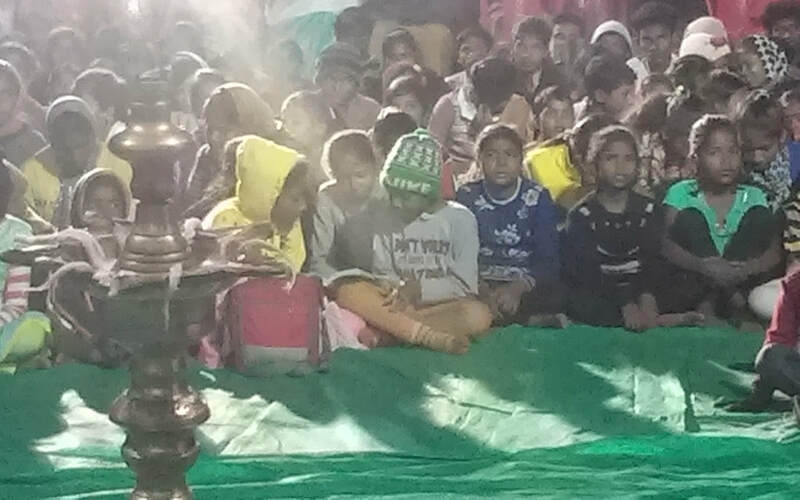 In the meantime, as the persecuted Christians shared with other Adivasi of how God had been with them through their terrible ordeal, others also wanted to join the Christian faith. By the time the Christian Missionaries returned to Ranchi a year later, they found thousand more Adivasi who were anxious to be baptised and learn about the Christian faith. 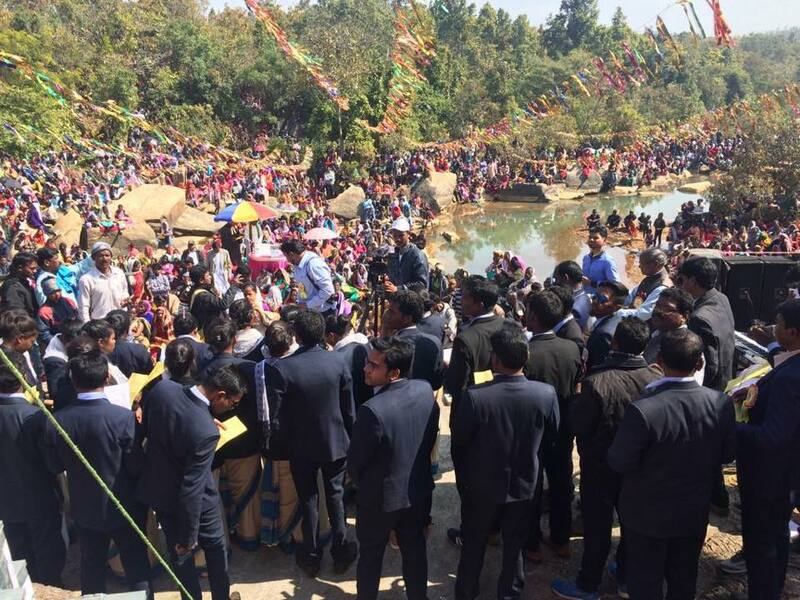 Now, 169+ years later, Christianity has spread among the Adivasi of this region, so that about half of them are Christian (Lutheran, Catholic, Anglican or other). * The Christians celebrate this important event, Kristan Dari, on January 31st (when the river is almost completely dry) 10,000 come from all over for this pilgrimage and celebrate the Lord's communion together among the rocks and sand beds. This year is also the jubilee year (100th anniversary) of the autonomy** of the Gossner Evangelical Lutheran Church. The mother church and the offshoot, the NWGELC, will be having celebrations that I will attend in July and November. Other Christians will join in the celebrations, for indeed all Christians in the region share in this glorious legacy. For the Adivasi, whether Christian or not, these are very difficult times in India. Minorities of all kinds are facing pressures from all sides. 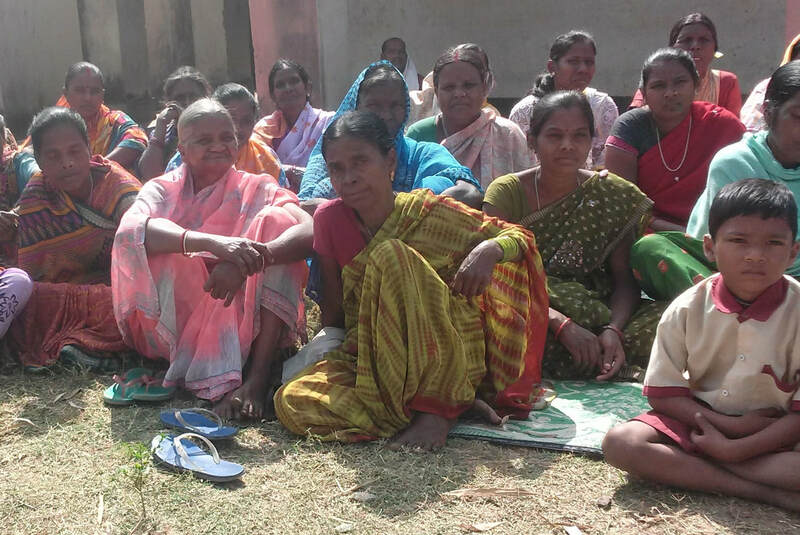 Indeed a few have benefitted from education and economic development, but even they have not lost completely their connection to the Jamin, Jal, Jungle. They remain essentially tribal: and must not lose sight of the environment (their houses, fields, work, animals, plants, trees, weather and sky)***, their ancestors, their children, their community, their culture. In the Bible the Jubilee year deals with land, property, and rights. Slaves and prisoners are to be freed, debts to be forgiven and the mercies of God would be manifest. When Jesus began his ministry he heralded the year of Jubilee as a perpetual reality of the realm of God, which is not some distant reality, but a very present one, to be lived out. So my hope is that the Jubilee year of Autonomy will bring much needed justice, mercy, reconciliation, liberation, to all living in the land of the orginal dwellers (Adivasi). * I hope to have the biography of my great great grandfather published by this summer: Among the Original Dwellers: The life of Ferdinand Hahnd. I make a case that the spread of Christianity had as much to do with the Adivasi as it did with the German missionaries. **Autonomy: 1919 the GELC (Gossner Evangelical Lutheran Church of Chota Nagpur and Assam) was granted autonomy by the British government. This means they ran their own church and institutions with only some support and partnership from the outside (western missions). This was the first native church to receive autonomy well before India's independence. The important thing is that if we don’t write down the stories of our grandfathers and grandmothers. Which might seem quite trivial, like the story of how the tiger got his stripes, and if you don’t write them down, then our stories are completely forgotten, and then the next generation has no wealth of knowledge. Even the smallest little detail might be something that can generate identity and connect the next generation to their heritage. So everything is important. So as a writing community we are hoping to write down and explain what we know, so the future generations will have the chance to understand our legacy. We have been dependent in passing on through oral tradition, but our generation is at a juncture because we are transferring to a written tradition and we now have a very less opportunity to hear about our ancestors from our forefathers. So it is unfortunate for us not to hear our old stories from our grandparents and pass on to our granddaughters and grandsons our own family stories. We are now very much dependent on digital instruments like mobile and other modern facilities. On one side this is good, but it is also a disadvantage (since we do not share orally). So we have to cope with both and we have to adapt the oral as well as the written. In times past there was no written tradition, we were very much in touch with our language and culture, now it is up to us to write our traditions. But we are forgetting, or are reluctant to know our culture, which is unfortunate. But now we are very optimistic and know we have to save all these things otherwise the coming generation will not know anything. I don’t know what your experience is, but my granddaughters don’t want to listen to me. I want to talk to them, but they view the TV or their mobile, and they look at it and talk there. I want to talk with them, but they do not want to listen to an old man. So how do we deal with this generation in this kind of situation to pass on what we have to the younger generation? One way is in writing, passing on in writing. So therefore story writing will be very important for this generation, and also the next generation, otherwise talking has become almost negligible. We have come to understand that we should write the history of our family, It is very significant if we did not have any direct contact, still we have a long history of how our ancestors lived in this land and how they came to the Christian faith. There are very interesting stories, and also some very disturbing stories. I think I want to write it down not just for my next generation but for others, those outsider our community, or new Christians, or those who are third or fourth generation Christians. Whatever our history we can preserve will serve many. The first book I have ever written is the biography of my great great granfather, Ferdinand Hahn, a German missionary in Chota Nagpur from 1868-1910. My family in American had little to no memory of him. My research of this forgotten ancestor, led me to learn of the story of the Adivasi and Christians of Chota Nagpur. And in this biography I write to preserve the heritage of both my ancestors and the Adivasi Christians. The book is completed and I have submitted to publishers, hoping that it will be published in 2019. 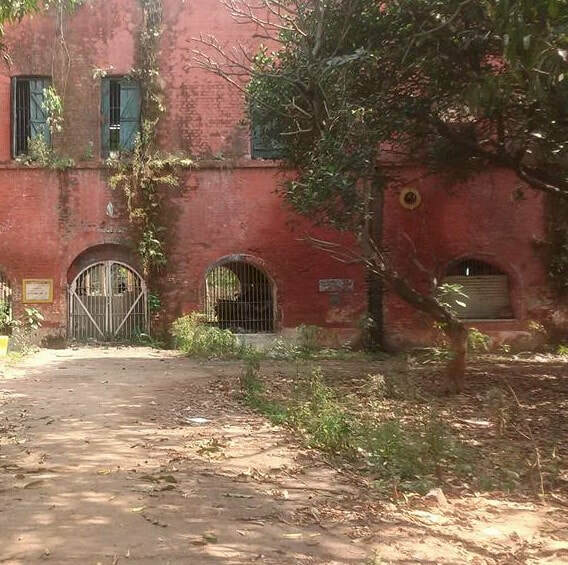 Many stories are forgotten and many sources of heritage are slipping away. However, I found that it is possible to piece the story of a forgotten past together through storytelling. Storytelling, is an interpretation of a few facts. It pieces together little snippets of material to make a beautiful whole, like a quilt. A good story is an authentic story, not necessarily a factual story. In my writing I fill in the holes where facts were not found, based on my interpretation of the facts that were found. I not only understand, but hope that as more information is unearthed, as more stories about the same facts are told, my story will change. I was not a writer, through this process I have become one. I was never good with grammar and language, though I loved to read. Through writing I have come to understand language better, and have improved my writing style. I wish to encourage people to write and write often to grow their skill. However, I also recognize that writing is not the only way to tell stories. There are those who like to tell stories, but hate writing. There are many who tell stories through poetry, song, dance, art and even food and dress. The Gonds have been telling their tribal stories through folk art; the Siddis tell their story through quilting. 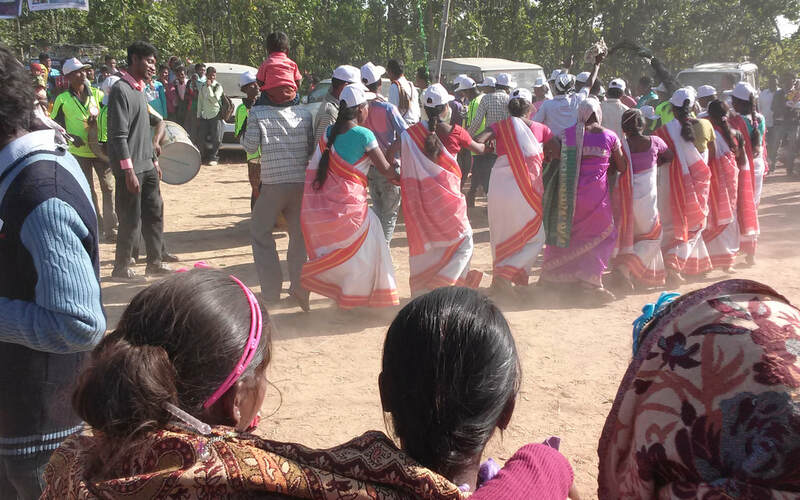 The Adivasi of Chota Nagpur (eastern India) tell stories through dance and song. 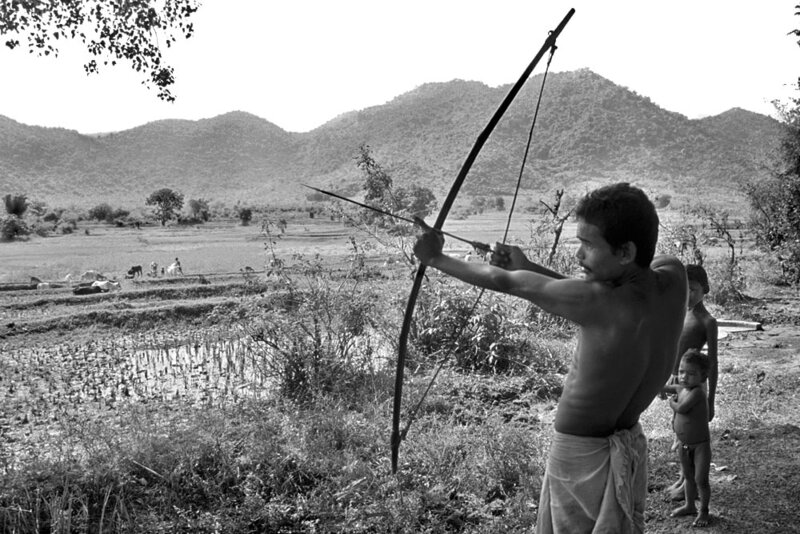 Mahasweta Devi told the story of a people through the bow and arrow in her work ‘Choti Munda’s Arrow.” All these elements of culture can be incorporated into storytelling. Many of us have learned stories of our family in the kitchen, watching our grandmother cook, or working along side our fathers, or playing games with other children, or finding an old tree. Everywhere there are stories. Who is the story teller in your family/village/clan/neighborhood? In my family it was my dad who was the storyteller. He tells over and over again stories from his life, as well as folk tales. When my mother was alive they use to argue about the details of the life stories. Through their different perspectives of the same story we children gained a bigger picture of what happened, about who our parents were and what mattered to them. And I am sure we still came up with different interpretations of the same story. As I was writing the biography, my father has been my primary editor. If the story resonated with him as authentic I felt that I was on the right track. I am now in search of other readers with different perspectives to find out how the story resonates with them. This is the true measure of the authenticity of a story. Writing is a journey. The writer asks a lot of questions and searches for answers. I had to figure out where to search, and sometimes I would find answers in the least likely place. It is like walking through the jungle, you never know what is ahead. The one thing I do not like about writing is that it can be isolating and lonely. Those people's who live in jungles therefore rely on community. This is why I also want to encourage people to create writing communities. I have found academic writing helpful to storytelling. The last writers workshop I attended was a group of Anthropologists who began to write novels based on their anthropological studies. They collect people’s stories and what they write, help all of us learn more about culture and humanity. I also appreciate Psychology and the various studies of Identity, emotions, and behavior. During my research, I relied on this body of work to enhance my story telling. In my journy, I utilized my local university that provided several writing workshops. Here I learned from others how to write. I was able to have others critique my work and learned how to appreciate finding out that something that sounded very good to me, did not communicate what I hoped. Writing is finding your own voice and learning how to effectively communicate. So this is why we I gathered other's interested in preserving their heritage when I arrived in Ranchi this last time, to create a writing community that would together explore finding, telling and preserving the stories of our heritage. At this first gathering of Heritage Writers on 5 November 2018 at the HRDC on the GELC church complex in the heart of Ranchi we had twelve zealous writers who shared their vision for preserving their heritage. Together we gathered ideas and discussed: What stories are important to tell? Where can we find these stories? What methods can be used? What medium is the best for communicating the stories? Who is the audience? I will share some of this conversation in future blogs. The community of writers interested in preserving Christian and Adivasi heritage in India is growing. If you wish to join this community you may contact me through this blog or through maribeti2004@gmail.com. My most recent visit to Ranchi in Jharkhand, India was the most inspiring of visits. Having completed my book, I still have to write my conclusion. I wanted to wait till after this visit because I would be learning more about a facinating part of their history that they are beginning to celebrate. In 1919 the Adivasi church that my ancestors were instrumental in founding gained its autonomy. One of the first native churches in India, well before national independence, to receive its independence (from missionary control). The intention to have a self-sufficient, self-administrating church was the original intention of the Gossner missionaries, including my great great grandather, Ferdinand Hahn. I attended a conference this time, as the church begins to revisit and revision the significance of this autonomy. I learned a great deal and was glad to be part of such important conversations. I do feel much better prepared to write the conclusion that will reveal that the vision Ferdinand Hahn had for the church and the people to whom he devoted his life, pretty much came to fruition. While I was there I thought I would see if there were others interested in Preserving our Heritage. When I first came two years ago, I had hoped that I would be able to learn by talking to people about their history. I discovered that many people, like me, had little knowledge of their heritage. Even so I also saw that there was a keen interest in learning their heritage. My hope is that my book, and the books my father translated into English of histories of the church written in German, will open people to discover their own heritage. For in writing about my great great grandfather, I also wrote the story of their heritage. I feel that there is still much more work to be done. The culture of the Christian Adivasi continues to be predominantly oral. The generation and keepers of the old stories are going away. If this generation does not preserve stories, many of them will be lost. While I was there I met with twelve others who were keen to write more about their heritage, and to create a community of writers that will encourage each other in the process. There are easily twice as men who I met who are keen to join such a community. I have decided to start a new blog that will follow the journey this writing community from Ranchi will take as they venture into discovering, writing and preserving their heritage stories. Each blog will be from our conversations, with some samples of writing. Click here to learn more about my first book available soon! Mary Girard with Bishop Nirmal Minz and his wife, Parakleeta, two remarkable leaders of the Adivasi Christians of Jharkhand. They are writer's themselves and have encouraged me much in my pursuit as a writer and have inspired many others. I am an author of my first book that is seeking publication. Among the Original Dwellers: Remembering Ferdinand Hahn, tells of the life story of my great great grandfather who was a missionary from 1868-1910 in Chota Nagpur. In writing his story I discovered the story of the Adivasi of the region who were also impacted by his life. I am now committed to inspiring others to learn and write about their Christian Adivasi heritage.